Fabric Matching - choosing fabrics to match in a bedroom, why and how? Fabric matching is a concept that often gets confused and is often lumped in with colour matching; which is a totally different thing. Fabric matching has more to it – as we shall see. But first things first! Today’s visit to the Reading job was threefold. Firstly, it’s always good to supervise workmen, especially when they don’t know each other, but they are working in the same spaces. Secondly, the magnificent dining table is due to be delivered and I wanted to check that all was in order and that it looked as fabulous as we thought it would. Thirdly, I wanted to evaluate the progress so far on this project; and that would involve investigating the paintwork and the other things that had been completed in the last week. The Reading clients are currently away on holiday and so we have a bit of time to spend in each room in order to think and plan what the next steps are. Today’s visit will also involve looking at the materials we have for the master bedroom curtains. So back to that fabric matching! Fabric matching is one of the delights of the job, but you would be amazed at how many people think that it is one of the main parts of my job. It certainly isn’t and you will realise that if you take on the role of an interior designer, the hours you will spend on putting together schemes, colours and fabrics can all be for nothing, if the client has other ideas. Today in the Master Bedroom we will look at fabric matching in greater detail. The paint colour walls are Farrow & Ball Light Blue. The woodwork, apart from the door, is also Farrow & Ball and is New White. These two rather subtle colours make for a peaceful and relaxing bedroom. Adding in Blossom Tree from Sanderson would be a pretty choice; being not too bold nor too girly. But we have to take into consideration the client’s thoughts about fabrics and at least look at some of the choices that she has found. These include a trailing leaf design from a Scottish fabric house called Voyage. Whilst this fabric is suitable for both curtains and upholstery, it is quite a thick fabric and therefore will be heavy at the windows. Add this to the lining and the interlining and you will have a very heavy set of curtains, at both ends of the room. The idea was to lighten this room considerably and although this will only be possible partially, because of the dark and enormous four poster bed, we can at least use lighter fabrics and light woods on the furniture, to create a fresher atmosphere. As you will see in the video and the picture below, the cane armchair from Graham & Green has a dark blue stripe upon a white background. This will sit well with the Blossom Tree fabric and will ground it, and not add anymore femininity to the room. Notice that the two blues within these two fabrics (below) do not match. 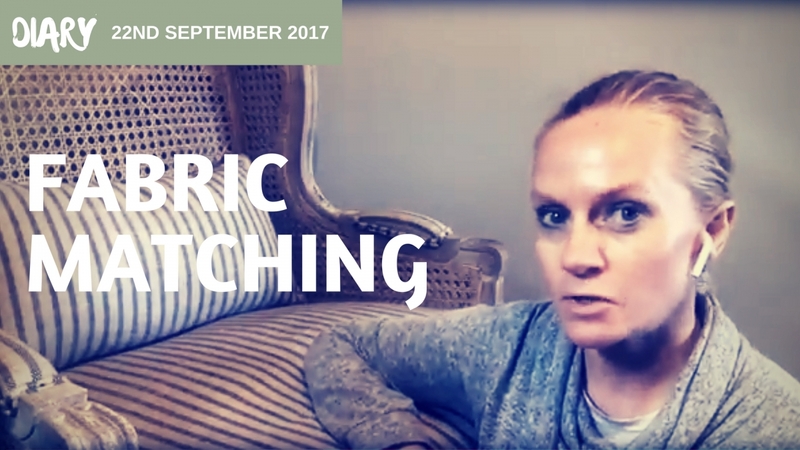 This is perhaps an oxymoron but ‘fabric matching’ does not mean the same as colour matching. Colour matching can be an exact science and although I have spoken about this many times, it’s as well to mention it again. Paint colours can and should be replicated but mixing your own colours or getting paint made up into your choice of colour – regardless of what brand it originally was. This is often done to save cost, but also to achieve a particular consistency, if that is what you are after. I spoke at length about this in my book so I won’t go on about it here. But fabric matching is altogether a more interesting and visual topic. Who is to say what fabrics go with other fabrics? It all comes down to personal preference and overall concept and style of a room. 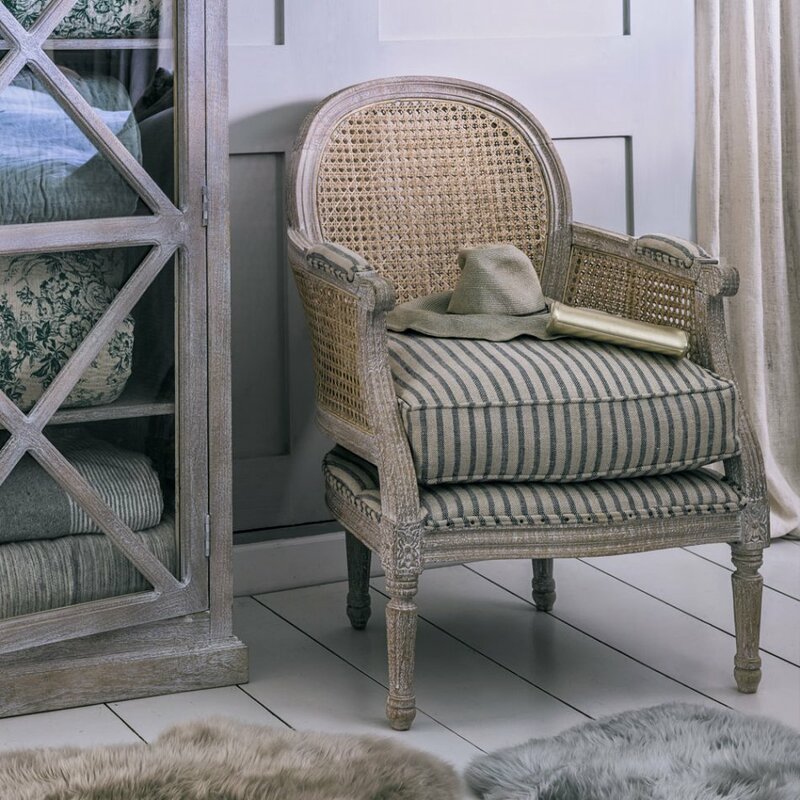 In this case, the ‘old school’ design of florals on a linen background marry well with the ‘old school’ ticking stripe on the cane armchair. 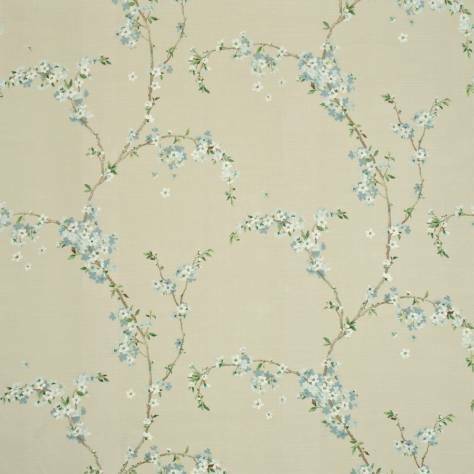 This is the Blossom Tree fabric from Sanderson.. In this case the concept and style outweigh the direct colour matching of the two blues in the two fabrics. Although it is this, that clients will look for first, taking as they do, the word matching to mean its dictionary explanation. This is one of the key reasons why designers prefer that clients stay out of the way whilst the designers do their work. It’s no fun for a designer to have someone, client or not, over their shoulder, questioning every decision or trial that is made. If you are a homeowner and you employ a designer, it is wise to get out of their way and let them do their job. This, however, is hardly ever the case. 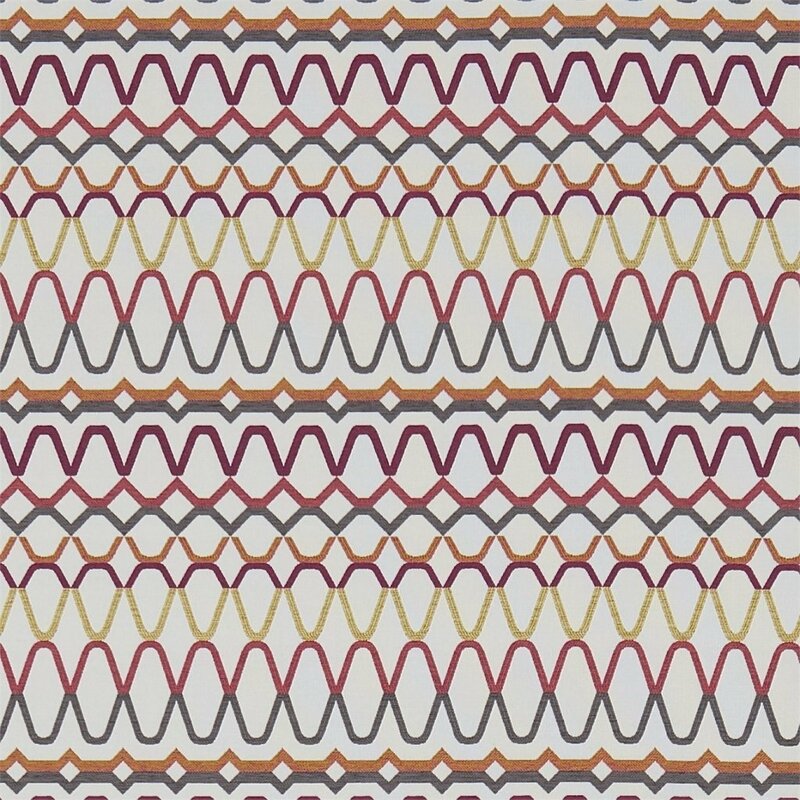 We are lucky today that the client is not at home and that I can show you a fabrics that are up for consideration and why we are looking at them, as we are. For more of this room to see how the fabrics turnout, see this post here. 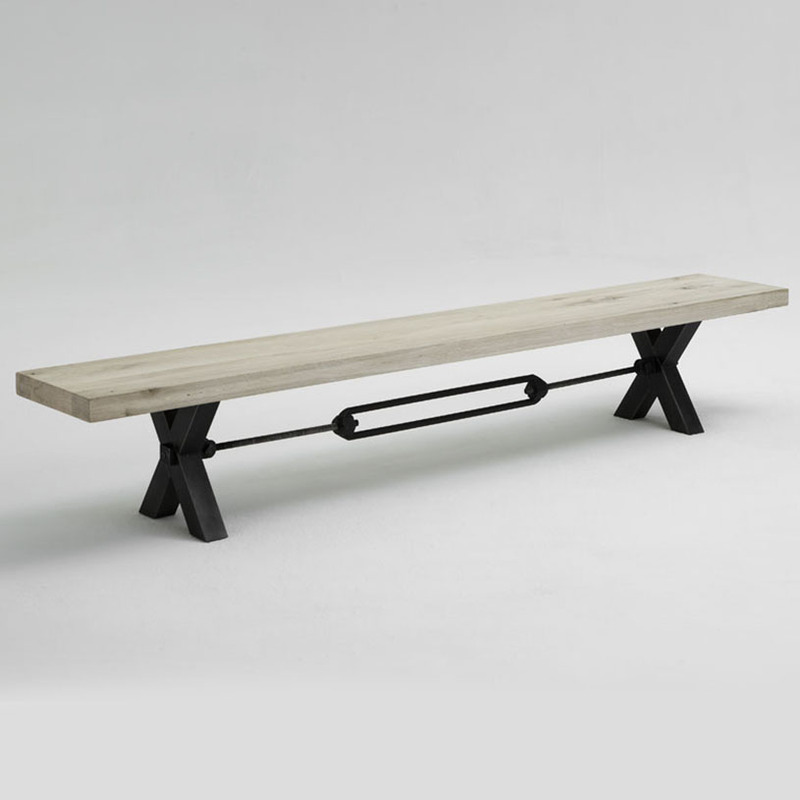 The dining table is a huge and heavy item from Amode. It comes with a bench, which we don’t see in this video, but we do see the construction of the table and what to look out for when the installation takes place. We will be getting a glass top for this table because the clients are a little worried that spillages will mark the table forever. Some clients like to see a table used and wood, being the organic material that it is, does well over years of useage. But I think these clients like to protect what they have and would like to keep the table looking pristine as it currently is. We will also be getting some new dining chairs for this table. Because we have a bench to sit on, one side of the table, we won’t need as many chairs as you would think. So we have settled on four and these (below) will be upholstered in grey linen, but will have dark wooden legs that will match the base of the table and bench. 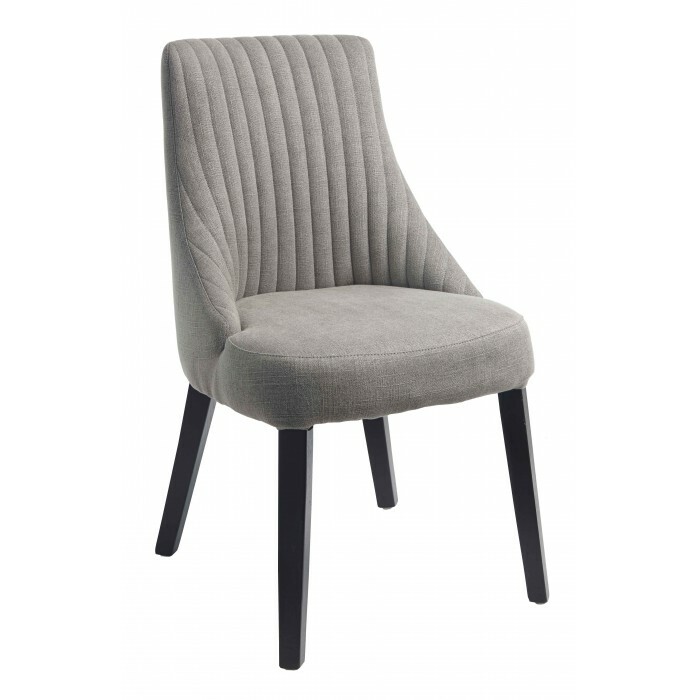 Here are the chairs that will be arriving shortly..
With the funky material (below) of Ada by Scion for the Roman blinds in this kitchen, the whole dining area has been changed from traditional and safe to modern and vibrant. In other parts of the house, the decorators have been hard at work refreshing inside the cupboard both on the landing, where the boiler and airing cupboard are situated; and the study cupboard, where the new shelving is due to be installed. You will see that when you come to renovate inside cupboards and mechanical parts of the house, you will find random cables, sockets and pipework that are redundant and can be removed. Naturally you have to check this with the client and as long as you check (and double check!) this with the client, then it is a wise move to remove any non working cables boxes or sockets. The study cupboard in particular has telephone sockets and wires in various parts that can be cut out. Electricians will have the equipment to check cables and sockets; to see if they are live and have power going to them. The electrical work in this house has not been enormous. But it has been sufficient to need a qualified electrician, to chase cables into walls and to connect the various wiring and sockets to the fuse board. Because this is a property that has not been renovated by me, I am working with what I see, not with what I know, to be true. So there is room for error, but mostly this is trial and error! I have not had any disasters yet! You will see Mark the electrician in the video, chasing the wall for the cables that will eventually be for the TV to be installed on the wall. He also found a piece of mesh tape which is often put around a door frame. This means that the wall that he was excavating, previously had a door in it. It’s a little like the house speaking to us and telling us a little bit of its history. Always interesting to find and even more interesting for the owner’s to know if they didn’t already. So that concludes today’s work on the house. I hope you enjoyed the video and I’ll keep you up to date on the other decisions and installations as they come on board at this property.